One gap in my knowledge of Georgia was the whole northeast corner, bordering the Russian republics of Dagestan and Chechnya. 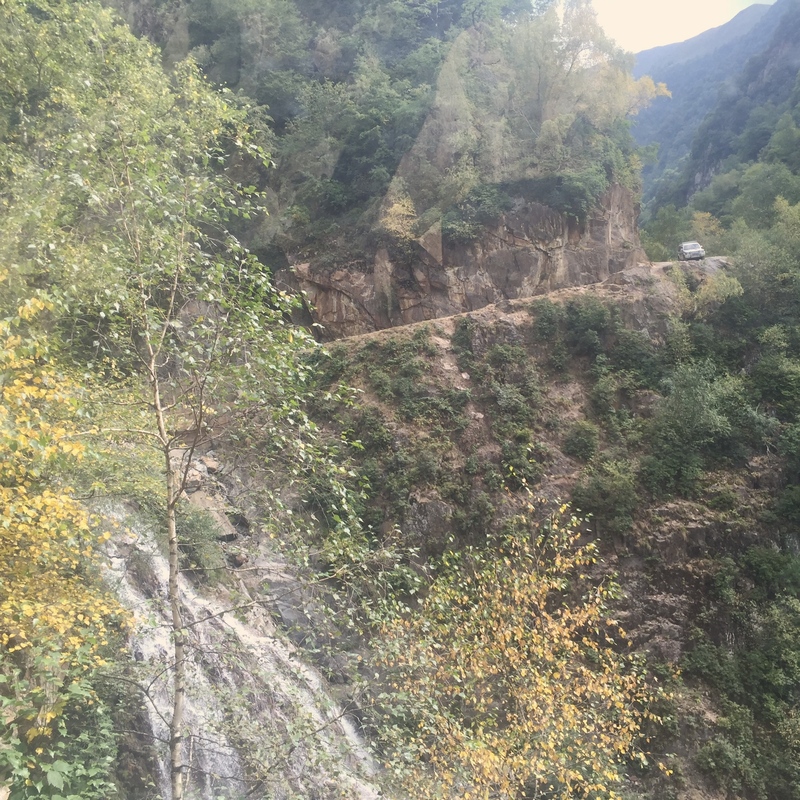 To explore this part of the Great Caucasus meant travelling on one of the worst roads anywhere, venturing beyond the modern world of tarmac, ATMs and Wifi, but that was part of the charm. My daughter Rachel, newly graduated in history and Russian, flew out to Tbilisi to join me and we set off to the northeast to explore. First we stayed in the lowlands, dillying and dallying a while on the sun-soaked plains of Kakheti, an old kingdom and now Georgia’s prime region for wine-growing. 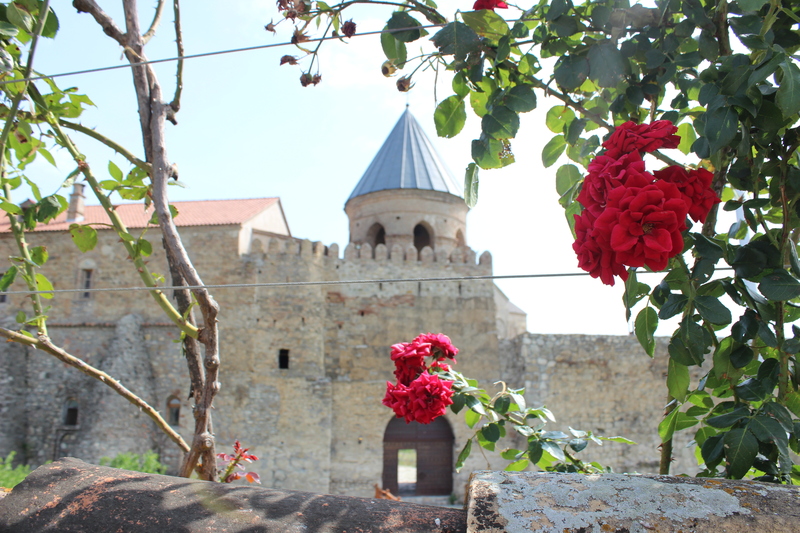 The wine, the quiet country charm and some sublime medieval architecture ensure that both the dallying and the dillying in Kakheti are of the highest quality. We used as our base the historic town of Telavi, one of Georgia’s most important medieval trade centres, and checked into a comfortable guesthouse with a garden and a spreading apricot tree. Naturally we took in a winery but also saw the 11th century cathedral of Alaverdi, a tribute to the skills of Georgia’s medieval craftsmen. Fifty metres high, for nearly 1000 years Alaverdi was the highest church in the country. A beautiful building barely known in Western Europe, it has a beguiling simplicity and is bathed in light from 16 windows in the cupola. The adventure proper began after Telavi. 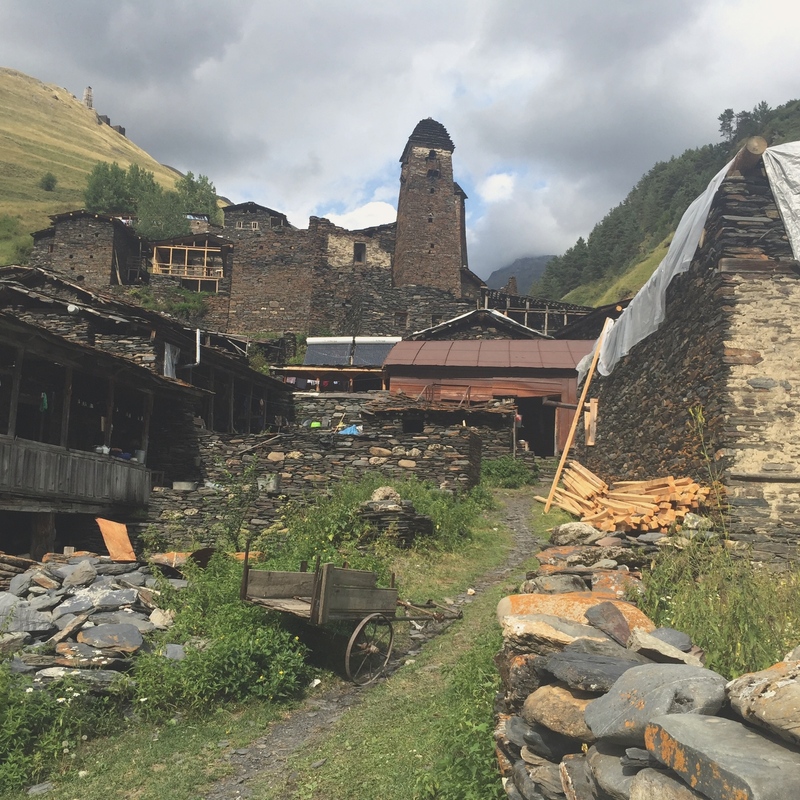 The idea was to travel in a 4×4 up to the village of Omalo in the high remote region of Tusheti. The road to Omalo featured in the BBC’s television series World’s Most Dangerous Roads. Our guesthouse landlady arranged a vehicle for Rachel and myself to travel with two Swiss sisters in their early twenties from Klosters. In these situations you do weigh up the driver and Levan, a middle-aged veteran of the road to Omalo, looked the business to me. We headed north across the plain, straight for the hazy wall of mountain ahead of us that was the Caucasus. The landscape held both the greenery of orchards and vineyards and the parched quality of a particularly dry summer – the rivers had very little water flowing. By the roadside were bucketfuls of peaches for sale and a donkey pulled a cart laden with watermelons. When the road started to climb the tarmac soon disappeared. Up close, the landscape still looked in places rather like a wall of mountain. There were moments when Levan had to switch on his windscreen wipers because water from roadside streams was falling onto the roof of the vehicle. That is a hint that the climb is steep. 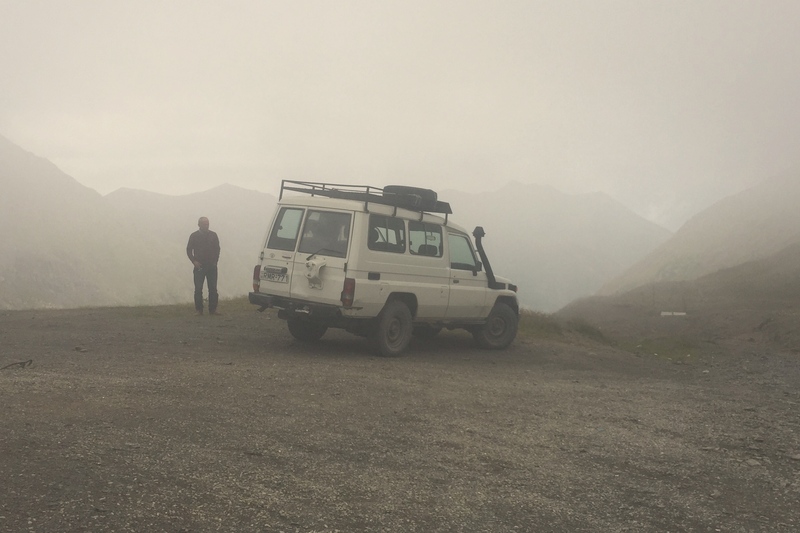 We made it to the Abano Pass, at 2,850 metres the highest drivable pass in the Caucasus. Clouds swirled and patches of snow lay on the ground – most of the year this road is closed. Four hours after leaving Telavi we pulled into Omalo, a scattered village with lower and upper parts on a broad, rising grassland topped by a medieval fortress. Built originally to protect local people from Mongol jnvaders, this fortress has benefited in recent years from the generosity of a Dutch couple who have taken the lead in restoring the towers that form the citadel. This is Big Country, with wide mountain panoramas, pine forests and a powerful feeling of space and isolation. Most Tushetians – the people of Tusheti – head for other homes on the plains when the snow starts to fall in October and leave only a token population to stay in the mountain villages through the winter. We settled into one of Omalo’s guesthouses and entered a little world of holiday-makers who by chance had arrived from several countries to dine at the one table. We sat down for our evening meal with the Swiss sisters Laura and Lisia and a Georgian family living in Kazakhstan’s largest city, Almaty. The evening meal turned into a supra, a Georgian meal with toasts proposed by a toastmaster called a tamada. And the supra turned into a political discussion which laid bare how concerned some Georgians are about their country’s future. The father, a banker called Mamuka Kirvalidze, took it upon himself to be tamada. I had been told at my first supra in Georgia that the first toast was always to God. “Not so,” said Mamuka, adding that in Georgia’s southwestern region of Adjara the first toast was to peace. lost a war with Russia in 2008 and since then Georgia’s two breakaway regions of Abkhazia and South Ossetia have become increasingly aligned with Moscow. 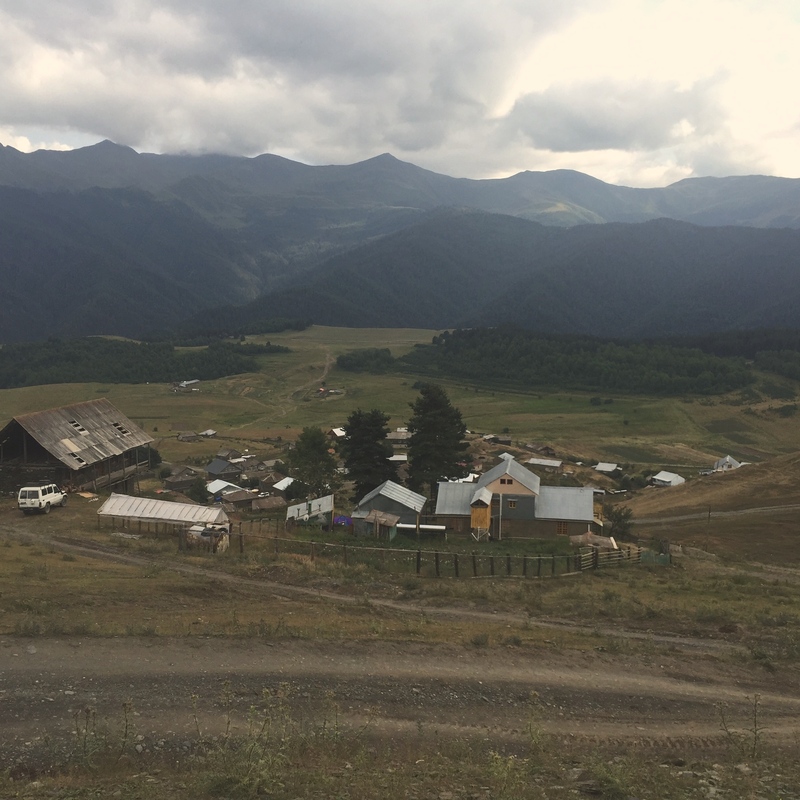 The big political story out of Georgia this summer has been accusations by the government in Tbilisi that Russia has shifted border markers in South Ossetia to expand the territory. Local Georgian residents say the border markers have been moved more than one kilometre. Russia has denied moving the markers, but the whole issue of Russia’s future intentions in Georgia hangs uncomfortably over the country. At our supra, the banker Mamuka was present with his wife, two daughters and teenage son Zurab. The toast to peace set a very clear tone and Zurab took on the role of ardent patriot, chafing at the bit to become a professional politician and protect his country from the Russians. “No politics,” said father to son at one point. But the “elephant in the room” – Georgia’s future as a nation – was clearly out of its box and could not be put back in again so quickly. One of the other toasts proposed by Mamuka was to freedom. “To freedom,” we said lustily and everyone knew exactly what the sub-text was here. It was a moving evening, focused on the deep concerns of a nation which has been invaded and brutalised so many times in its history. The next day I set out with Rachel and the Swiss sisters to walk north, deeper into Tusheti, to the village of Dartlo. We hiked on a jeep track over slopes forested with pine – Tusheti is a reminder of how beautiful a natural pine forest can be. It is a different thing entirely from a conifer plantation, with trees interspersed with rocks looking like the very essence of a Romantic painting. Along the way we grazed on wild raspberries growing by the roadside. For the last stretch we walked along a deep valley where the two sides were utterly different – on our southern side of the river the slope was covered with trees while the other vast mountainside opposite us was bare, with shifting herds of sheep. What a mix of folk! There were Russian bikers, courting couples, French-speaking tourists and down by the river a summer camp of Georgian university students. In the evening they played frisbee and split logs for the fire. There was a holiday mood, just a few kilometres from Chechnya. To add to the general feeling of activity it was shearing day and four Georgian men were busy with their electric shears and creating a great pile of wool. You can have absolutely no idea what places are like until you hit the road.